Adopting one of these green new year resolutions or as many of them as possible, will help the environment and your wallet. Just making these changes could save you £1167 a year, read on. An unmissable evening of talks and presentations by leading authors and permaculture pioneers explaining how pasture can Save Farming * Solve Global Warming * Feed the World Increase Biodiversity * Re-Green the Deserts * Improve your Health! Looking for things to do this summer? Here are three events which are free of charge and will get everyone into the great outdoors running around, letting off steam and having fun! The Aldingbourne Trust is one of the magical hidden treasures of Sussex. Take your children this half term, have fun and support this fantastic charity. Not only are they beautiful but they are using what Mother Nature has left behind to create another form of art. These ladies build horses out of the driftwood they find…..
SATURDAY 29 SEPTEMBER 10AM-3PM DOWNLANDS COMMUNITY SCHOOL, DALE AVENUE, HASSOCKS, SUSSEX. 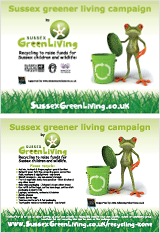 Free admission Sussex Green Living will be participating at this Autumnfest event, so come along and meet us. HKD are the organisers of this great family event.